Behold! Toronto Mayor Rob Ford has been immortalized in a painting unveiled at City Hall on Thursday. The portrait, featuring a smiling Ford, was painted by councillor Gary Crawford. Ford's mother, Diane, gave the work a positive review. “He captured the essence of Rob,” she said at the portrait's unveiling. “I can see 10 different personalities,” she added. The painting will be hung in Diane Ford's living room. According to a press release, the painting was done free of charge by Crawford and Thursday's unveiling was the first time the mayor saw it. “Words don’t describe how much this means to me,” Ford told the Toronto Sun. He also tweeted his positive response. Crawford had been documenting the portrait's creation on social media. 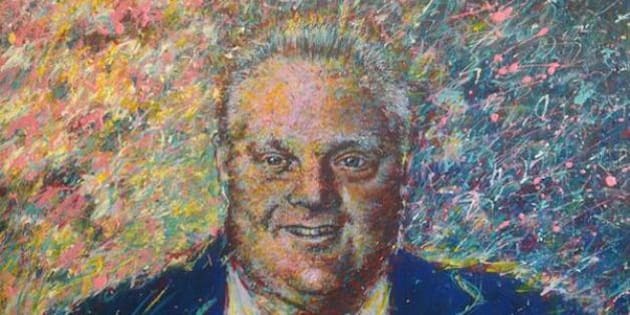 What do you think of the Rob Ford portrait?